Thousands of events have been organized every year in a different niche. To be able to organize them successfully you not only require excellent marketing strategy but also you need to be able to deliver useful content using a feature rich responsive website. Well, finding out the best Joomla event templates among tons of Joomla Template is not that easy. To make your work easier, we have dig out the web over the one month and got some of the best Responsive Joomla Event templates of all time. Today, we will discuss top 10 Joomla Responsive Event Templates. After month-long research, JA Event II bound me to list at the top. Why? 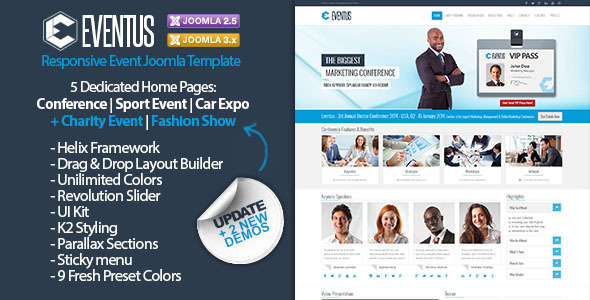 It is one of the best Premium Responsive Joomla Event Templates in the current market. You don’t need to believe on my words, as you will get to know its robust features when you check this template demo. It is fully responsive and developed on a Powerful T3 framework with Bootstrap 3. With this stunning Joomla Template, you will be able to set up an event website with speaker details, Google Map for the event location, multiple custom pages, and theme color. JD Conference is another robust, super-cool, one page Responsive Joomla Event Template. This template comes with Helix 3 framework, Bootstrap, and SP Page Builder Pro (Save $49). Its powerful drag and drop page builder and simple admin panel help you launch a website in just a few clicks. You might be thinking how come it is possible. Well, here you do not need to write any code. Just drag and drop the elements would solve your purpose. And much more exciting features. If you need an event website which is designed to catch visitors attention than you must think of Eventum. It is a fully responsive Joomla template with drag and drop page builder. If you are a newbie and do not know much about the technology you must think of choosing this template. Why? Because you can build a fully functional conference, Meetup, and Event website just by drag and drop the elements with no coding experience. Is not it super cool! Eventus is a modern, clean and sleek Joomla 3.x Template designed for conference related websites. It comes with 5 dedicated homepage variations- typically conference, sports event, car expo, charity event and fashion show. 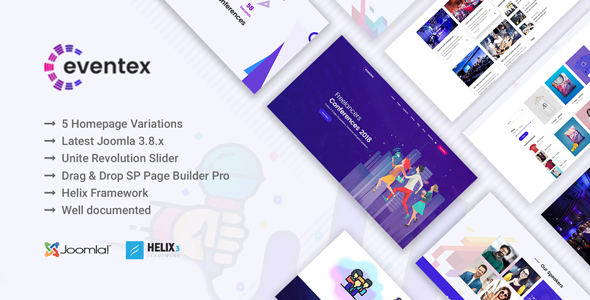 It is developed on powerful Helix 2 Framework which offers tons of features with lots of customization options by utilizing layout builder and unlimited color options. JM Events Agency can be a perfect solution for all event planners. With its amazing tools and colors, you can showcase and promote events like a pro. This awesome Event Joomla template developed on EF4 Framework & Bootstrap 3.2 which is known to be one of the best Joomla Frameworks. Template Monster introduced “Event”- a clean, well-designed, and powerful Joomla Templates for events.This template offers a rounded package which further makes it easy to advertise your Events. One of best features of this premium Joomla Template is that it offers different styles to list events or conferences without any expensive Joomla event-management extension. MiEvent is a fully responsive, clean and sleek, one page Joomla Event Template with pixel perfect design for events, conferences, meetups etc. It is garnished with powerful Page builder to create distinctive website pages just by drag and drop the elements. Moreover, they also included 16 demos with coming soon pages. Its advanced coding helps to loads a page in seconds. Eventory is a fantastic modern Responsive Joomla Event Template developed by a highly enthusiast team of Templaza. This Joomla template is based on Plazart Framework and compatible with Bootstrap 2.3.x. That’s why it would perfectly fit with all the mobile devices irrespective of size. This template also comes with the latest version of TZ Portfolio that has new functions for interface and image. Meetup conference event Joomla template is assembled with tons of stunning features. It has got a separate section for Event Schedule, Speakers, Location Map, FAQs, and Registration Form and a few others. This Joomla event template will not disappoint you once you get a website live. Eventex is another powerful, modern fully responsive Joomla event template for all your conference needs. It comes with 5 beautifully crafted homepage variations that will surely impress your visitors. It has an awesome and well-managed programme section which has all the main information regarding the event including date and time, speaker, venue etc. The above mentioned Joomla Event Templates have been used by many people from across the globe. Most of these Joomla Templates have designed to meet specific niche. We are hopeful that this will definitely help you to choose a Joomla Event Templates. If you have anything specific to know, don’t be shy to drop a comment. Stay tuned for updates.